Note: This article first appeared in the April, 1998 issue of The School Administrator. 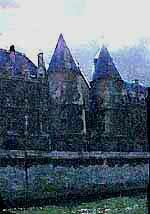 © 1997, Jamie McKenzie, all rights reserved. Many districts are finding out with considerable pain that it is not enough to install an expensive network tying all classrooms to the Internet. It is not enough to place a laptop in the hands of each student. After all that money and all that planning, some schools districts find themselves suffering from the screensaver disease . We are talking about the educational equivalent of Red Ink . . . the observable failure of schools to actually use their network or computers to any meaningful extent because they are not seen as part of the school's primary mission and teachers are ill prepared to integrate them into their classrooms. After two decades of effort and billions of dollars, computers and new technologies remain peripheral (read "tangential" or "irrelevant") to life in the typical American classroom. Except for a hardy group of pioneers who have shown what is possible, the bulk of our teachers lack the support, the resources, or the motivation to bring these intruders into the classroom core. These technologies remain for the most part "outside the walls of the city" like the Greek armies surrounding Troy. We do not need a Trojan Horse to end this siege. New technologies will be welcomed and used daily by the vast majority of teachers when schools pay attention to a few simple lessons we have learned in districts which have been successful. 1. Make learning goals very clear. In all too many cases, technology plans are silent when it comes to student learning or they wax eloquent on lofty goals which relate to the millennium, the workplace and the society at large - goals which translate poorly into daily classroom realities. Until classroom teachers are shown how new technologies can improve the way students learn and think in social studies, science and math class, they are unlikely to sit up, take notice and make significant use of these new tools. Engaged Learning challenges teams of students to employ information technologies to investigate authentic problems which parallel curriculum questions and topics. In a similar vein, Information Power, a publication being developed by the nation's librarians, suggests that our goal must be to show students how to solve problems and make decisions. Technology is not an end in itself. It is merely the highway or the car or the airplane which takes you where you want to go. Successful districts put student learning at the forefront of their planning, and then they design a technology project which combines the best of staff development practices with curriculum development and network installation. Some districts make the mistake of claiming dozens of goals. It is essential to focus upon two or three main possibilities . . .
Teachers are most likely to embrace technologies if they can see the connection between their work (covering and exploring the curriculum) and the tools. "How does this help me teach social studies or writing?" they might reasonably ask. The best strategy is to write technology expectations into the curriculum guides. Every curriculum document should identify learning experiences and strategies which require the use of new technologies. For example, the language arts curriculum must state clearly that students in second grade right up through the end of high school will compose 10-15 papers annually using word processing software in combination with rich electronic information sources. The curriculum guide outlines the requirement that these writing exercises be done in concert with the principles of "writing as process" which takes students through stages from pre-writing to final draft - all on the computer. In a similar manner, the social studies and science curriculum should name the occasions for analysis of data, global e-mail partnerships and investigations using electronic information. Why are we doing this? How we do reading, writing, 'rithmetic and reasoning are all changing with the arrival of the new information technologies. Good schools step out in front of these changes and ask how to build a curriculum which prepares students for the future they will inherit. All too often the focus of technology planning is limited to the selection, purchasing and installation of hardware and infrastructure. One sees far too little attention to what must happen prior to installation and what must follow. We must think of this venture as a five year journey at least. The technology plan should focus on cultivating and developing as well as installing. Sometimes it works to use a gardening metaphor. Those who fail to cultivate and fertilize the soil prior to planting rarely achieve a harvest worth mentioning. Those who fail to weed, maintain and develop the garden, once planted, are likely to see their plantings languishing or failing to thrive. Cultivating the Soil . . . In the case of technology, the "soil" is the community of learners and teachers who will be expected to use these powerful new tools. It makes no sense to wait until all of the equipment arrives to begin the all important "human resource development" which is explored in the next section. Those districts which increase "technology readiness" by investing in a vanguard or cadre of talented people will reap the greatest benefits when the bulk of the installation takes place. Without this cultivation stage, districts are likely to fall victim to the technology-driven design illness which has plagued most districts because there will be insufficient internal knowledge of how to use these technologies to support the curriculum and the district will probably turn to outsiders who know little about classroom learning to design, install and manage the network. Technology-driven design is shaped by the interests and perspectives of network engineers and business people who may not have the vaguest clue about learning, student research models or the design of information systems to support students and classrooms. Technology-driven design often results in the highest percentage of disuse and screensavers. The network operates smoothly but delivers nothing worth a student's time. The resulting configuration of computers and the offering of information services is often irrelevant to life in schools. An example of education-lite technology design would be the decision to place three networked computers in every classroom of a district. This model does not work for teachers or students but it sure makes installation and network planning simple. Those who have tried creating "technology powerful classrooms" find that you need one computer for every 3-4 children in a self contained elementary classroom and one for every 2-3 students in secondary classes which switch every 40 minutes. They have also found that it is a waste of resources to put so many computers in the room of a teacher who intends to lecture all day. The technology-driven design ignores these classroom realities and places cable and computers every where regardless of what we have learned about how these technologies work best in schools. Few districts project the true cost of keeping the newly installed network operating over the post-installment decade. In fact, most plans are silent on "replacement" and make no financial plan to address the 36 month life span of the modern computer. This failure can leave districts sitting with slow-moving dinosaurs wearing the Emperor's New Clothes. Thanks to the product development tactics of computer hardware and software companies which thrive on the planned obsolescence as outlined in Data Smog (Shenk, 1997), schools may only count on three years' of reasonably efficient use of any computer before the new software slows performance so dramatically that staff and students are spending a third of their seat time just waiting and watching. Two other issues require sustained commitment. The first of these is the development of effective information resources to be offered over the network. A primary purpose of a network is the delivery of information which richly supports the curriculum. This challenge is a constantly evolving one requiring a substantial investment of time and money as the information products (on-line periodical collections such as Electric Library, EBSCO and ProQuest) are in their infancy and require careful testing before purchase. They also require an enormous amount of time and labor to install on a network. Some people think the job is done when the computers are installed and linked. Installation is only the first quarter of the game if you intend to provide a robust network which supports the learning goals of the schools. The second major issue requiring sustained commitment is the technical staff support to extend and develop the contents of the network. Few districts hire enough technicians to service and support the ongoing development of the network content. Each new information product and each new piece of software may require hundreds of hours of installation time, but most districts have so few technicians that the installation of these products can be delayed for months or simply ignored. Once a district spends millions on a network, it should hire enough technicians to make sure the network operates in an efficient and robust manner optimizing return on investment. Staff development is the single best insurance policy against the screensaver disease identified earlier. The best way to encourage teachers to embrace these technologies is to give them personal learning experiences which win them over to the worthwhile classroom activities which are now possible. For too long we have failed to provide adult learning which shows how to employ the technologies to explore topics from social studies, science, language arts, or math. The technology classes have all too often been mere applications classes . . . Cool Things You Can Do with Excel or Advanced Desktop Publishing taught by well meaning colleagues who may know the application but not know how one might use Excel in social studies class to crunch Census data. This challenge is not about training. It is about learning. If we expect teachers to turn around and use technologies daily with students they need to discover personally the power of the new technologies when combined with rich information. We also need to provide more informal support structures such as mentors, coaches and "just in time help" which often do more to promote risk taking and growth than formal class offerings. The best way to enlist a much larger percentage of teachers in the use of technology is to offer them a combination of rich information and powerful tools. Those who have held out for decades against fads and bandwagon drill-and-kill software can be won over by good information which is relevant to the curriculum. Engage teachers in researching authentic problems such as treatment options for Alzheimer's Disease or cancer and the response can be very positive. Once teachers see what we mean by Information Power, they will often embrace what they once rejected. Resources from Connected Classroom, Scholastics, etc. Those who expect to support curriculum with nothing more than the free Internet will soon discover that there is no free lunch and neither staff nor students will be able to conduct robust and satisfying research on most topics. Assessment is a powerful tool for program revision and change. In the case of Bellingham (WA), the continued use of instruments such as the Mankato Scale ( Originally created by the Mankato (MN) Schools, this self-reporting survey has been revised to match Bellingham's evolving program goals. Copies are available for downloading at http://www.bham.wednet.edu/assess2.htm) to measure learning by staff and students since 1995 has made a major contribution to the design of the program and the creation of staff development opportunities at the building level. 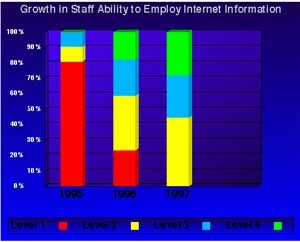 The accompanying chart demonstrates dramatic change in teacher capacity to employ the Internet in support of classroom objectives, for example. ___ Level 1- I do not use Netscape, nor can I identify any uses or features it might have which would benefit the way I work. ___ Level 2 - I can start up Netscape and use district World Wide Web menus to find basic information on the Internet, but I spend little time doing so. ___ Level 3 - I am able to make profitable use of Web searching software as well as lists of Internet resources to explore educational resources. ___ Level 4 - I can create my own HTML pages and hot-lists of resources. I have shown my students how to mine the information resources available on the Internet as well as other networked information sources. The full Mankato Scale examined twelve aspects of staff technology competency. As a second part of the assessment strategy, the district developed performance tasks requiring teams of students to solve problems with new technologies. This component led to major changes when it revealed that students were more skilled at pushing buttons that they were at communicating, analyzing data and solving problems cooperatively in teams. Unfortunately, the failure to assess the results of technology investments continues in most places today. Ignoring assessment is like driving a car or flying a plane blindfolded. If we do not measure what students can do with these new technologies, we are likely to keep on doing tomorrow what we did yesterday even if that strategy is a waste of time. Assessment provides a reality check. It affords us a chance to switch directions and steer the program towards the destination we chose when we set out. We can end the siege, effectively bringing new technologies into the core of the regular classroom program if we combine all of the elements listed above in a concerted, systematic approach. This combination will require balanced, prolonged funding and a sense of strategy. Those districts who persist in putting all of their technology eggs in the hardware basket are likely to wake up with Humpty Dumpty screen savers. Those who invest in human resource development, rich information and authentic assessment to accompany their hardware purchases will bestow the gift of Information Power upon staff and students alike. Enjoy the ten sites I have selected as the Technology Top Ten. All of these sites provide significant resources to guide a school or district forward in the use of technology to support engaged learning and student centered classrooms. Credits: The photographs were shot by Jamie McKenzie Order Jamie's. Some were also modified with Photoshop.